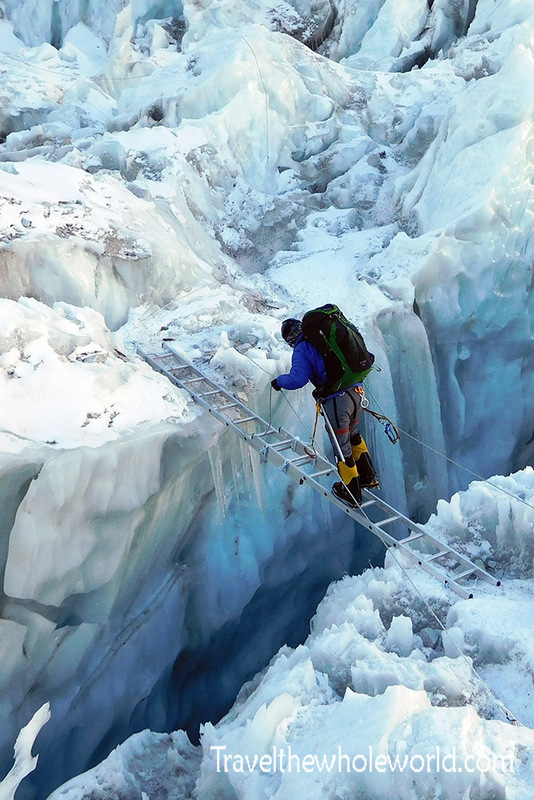 The Khumbu Icefall is the first challenge of climbing Mt. Everest. Early in the morning you’ll leave leave base camp and begin your ascent to Camp I. Without question, the icefall is one of the most dangerous parts of the entire mountain and has claimed lots of lives over the past several decades. I found that the icefall didn’t look all that steep when viewing it from Everest Base Camp, but that’s a bit misleading. I took this photo above while standing on a nearby mountain; Pumori’s advanced base camp. I was at an elevation of 19,500 feet (6,000 meters), and there doesn’t seem to be a better vantage point than this of the entire icefall! For those who have never seen the icefall before, you might not know exactly what you’re looking at. 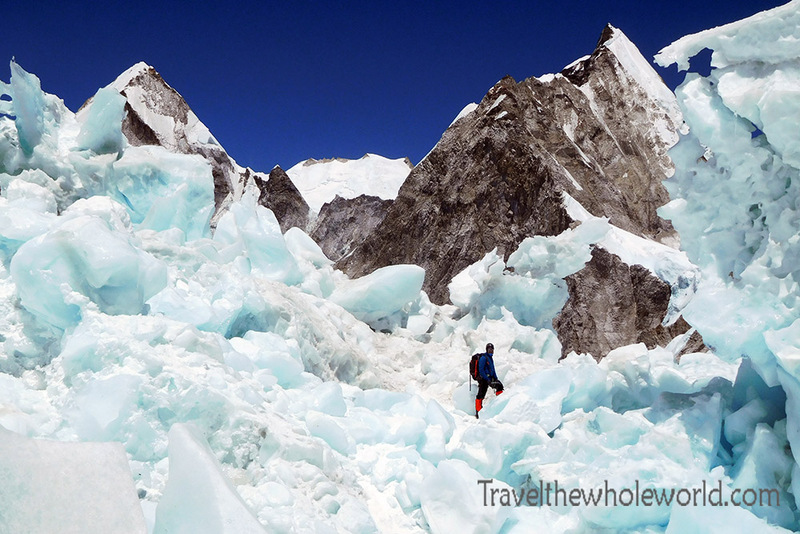 The Khumbu icefall is a river of ice that moves several feet a day. All that movement makes it highly unstable and dangerous. 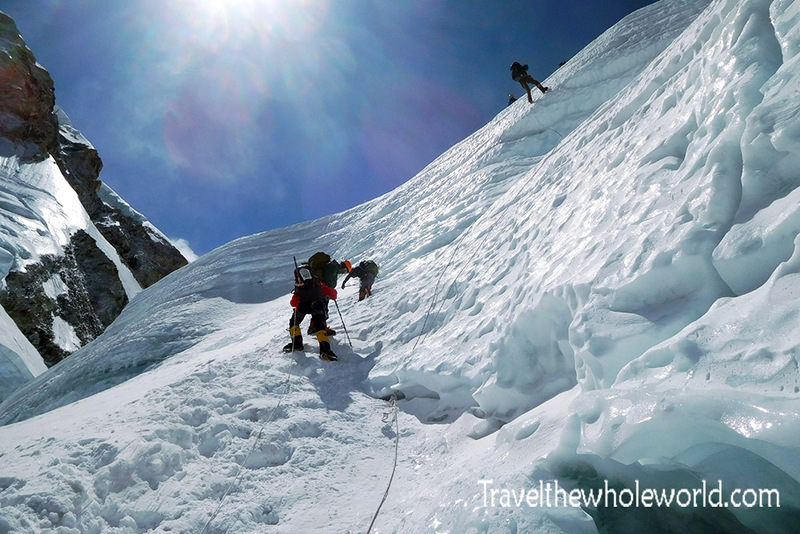 There is simply no other way to approach the mountain from the Nepal side. 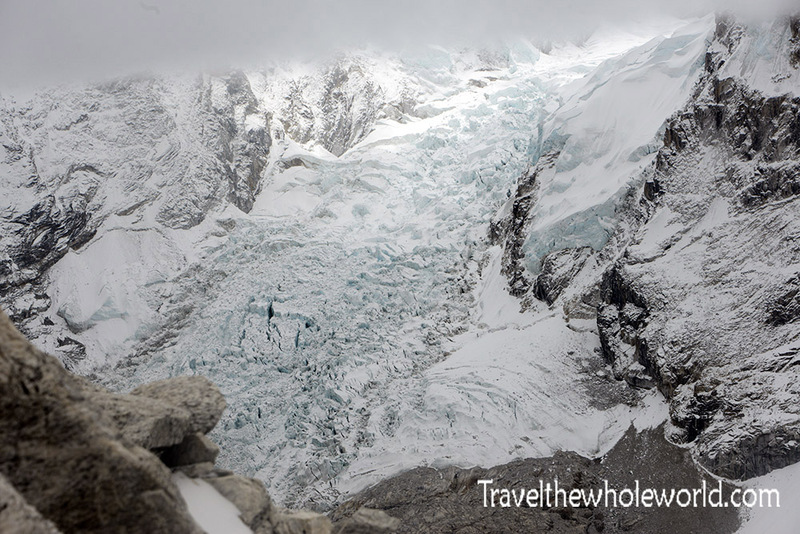 The icefall beings in the lower left part of the photo and rises up towards the upper right. The elevation begins at 17,500 feet (5,300 meters) and ends at 19,500 feet (6,000 meters). 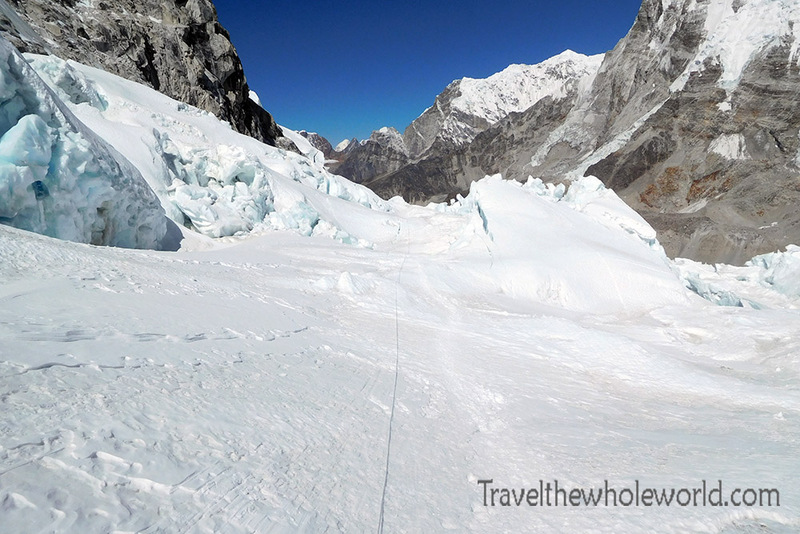 The icefall is right outside of base camp. As big as base camp is though, the entrance could be a five or thirty minute walk to the first crampon point. 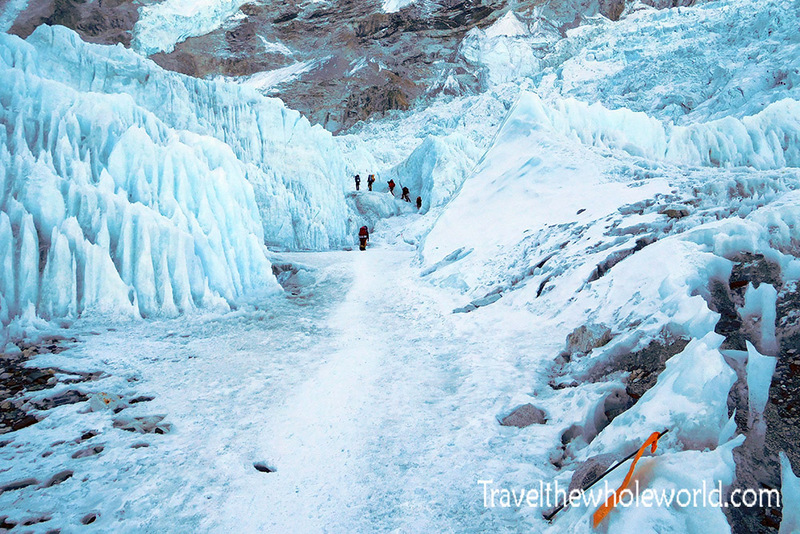 Generally people leave to go through the icefall after midnight and sunrise. The ice is the most stable then and is less likely to collapse, but anything can happen! I actually made four trips through the icefall as I had gone up and down to acclimatize. Only once did I go up at night. The other times were very early morning or in daylight. 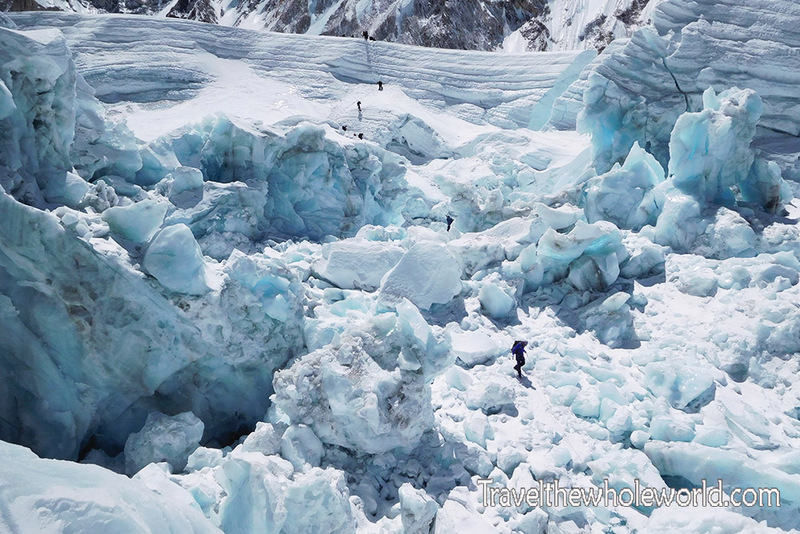 Below you can see a photo of some of us going back to base camp at the very end of the icefall. Since the icefall moves several feet a day it is obviously constantly changing. Parts that you have to ascend like in this photo above might completely different or not even exist the next time you return! 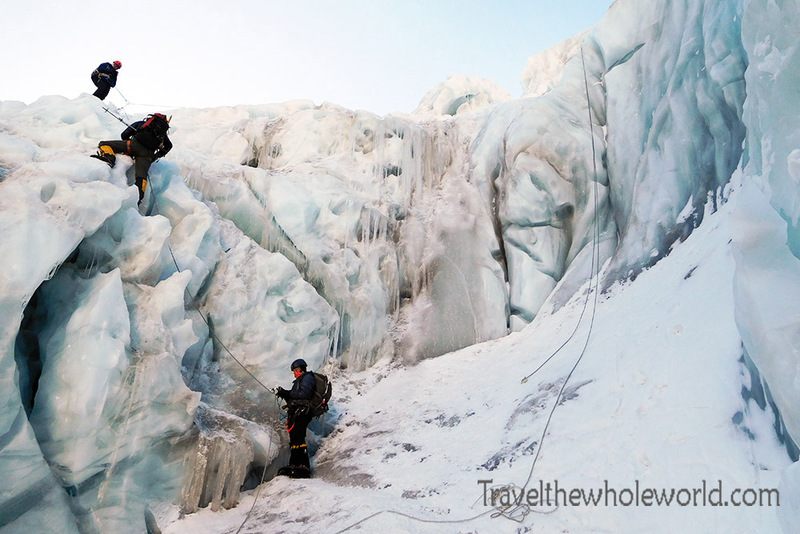 The icefall is famous for the use of ladders to cross open crevasses and vertical ice. 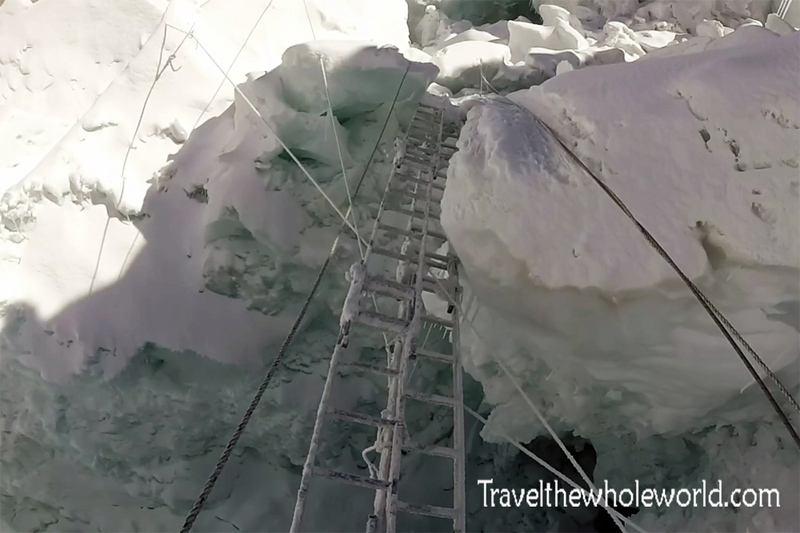 This ladder above was the very first one that I crossed while in the icefall. The vertical one below was the second. I should also mention that by chance I saw my expedition leader from Denali coming down the vertical ladder for the first time in six years! The first crevasse in my photo above was always here and never changed. During the climb some other ones suddenly opened up and new ladders were installed. Because the icefall is such an unstable environment, the route through it constantly needs to be checked on and adjusted. If climbers were to bring their own gear, everybody would need to carry a few hundred pounds of ropes and ladders. That would make absolutely no sense and create a logistical nightmare. Instead there is a dedicated Sherpa team called the ‘Icefall Doctors’ whose sole responsibility is to maintain the route to Camp I. It’s a very dangerous and demanding job, perhaps one of the most dangerous in the world. 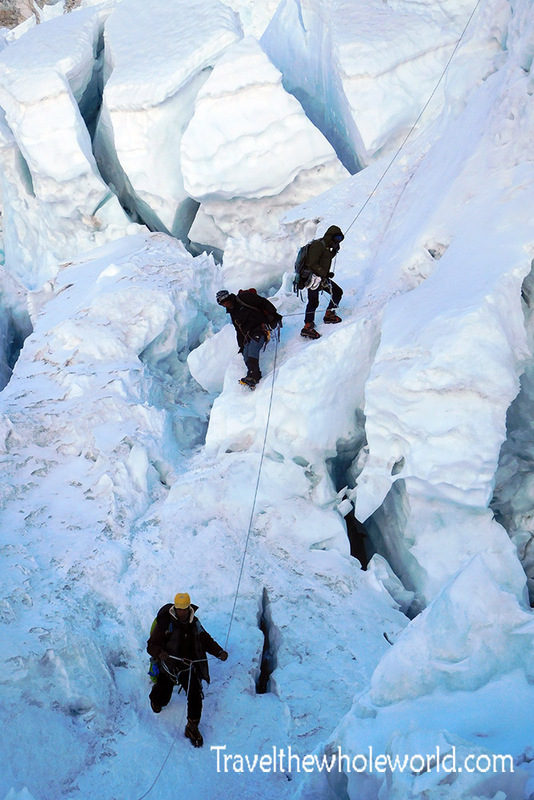 Here’s a photo of some climbers descending the icefall. Sometimes this place can be crowded, but as I went during a year that saw half the normal climbers I rarely had to wait on anyone. 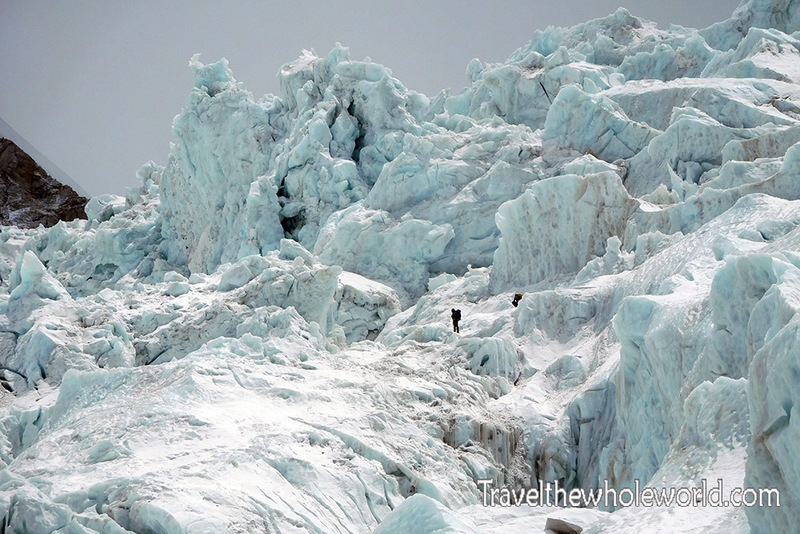 Often times I didn’t see anyone at all and felt like I mostly had the icefall to myself! With the icefall changing so often and full of challenges, it would be nearly impossible for a single person to maintain the route. So if you’re wondering how the first person to climb Mt. Everest, Sir Edmund Hillary, was able to cross here I found the answer. It turns that instead of ladders, logs were carried up from the valley below and laid across the crevasses. This took an incredible amount of manpower that required nearly 500 Sherpas! It’s difficult to get any perspective of the icefall without any people in the photos. Here you can see how small these two climbers above look with the giant ice ceracs above them. Remember that the ice here often breaks without warning and getting crushed by it is a serious risk. My first time going up the icefall I heard a piece of ice crack and just that alone was incredibly scary. 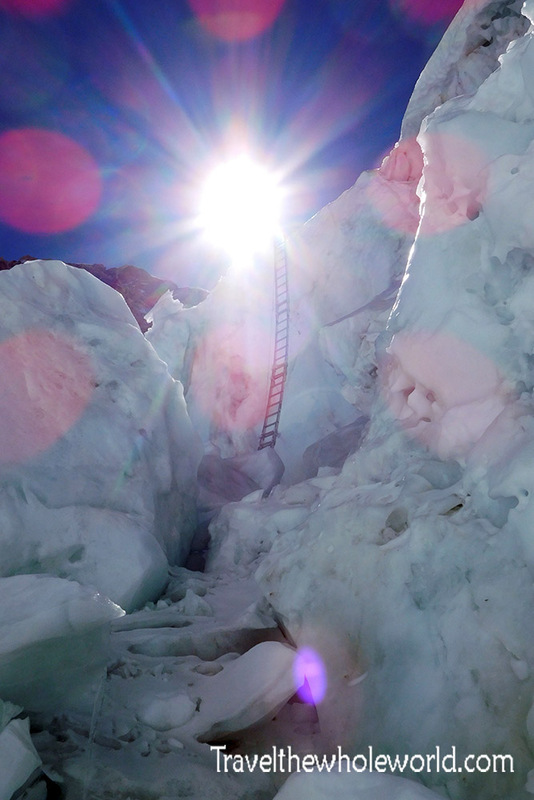 Below is a photo of myself going down a small vertical ladder in the middle of the Khumbu Icefall. People always ask me how deep are the crevasses in the icefall. Every one of them is different, but this photo can give you an idea of how deep they can be. At the very top of the photo above you can barely see a small ladder crossing the crevasse! Although crossing the ladder itself isn’t too bad, the main risk is that the edges of the crevasse can collapse inwards bringing the ladder and yourself down with it. You’d have to be incredibly unlucky to be on the ladder when this happens, but it is a possibility! 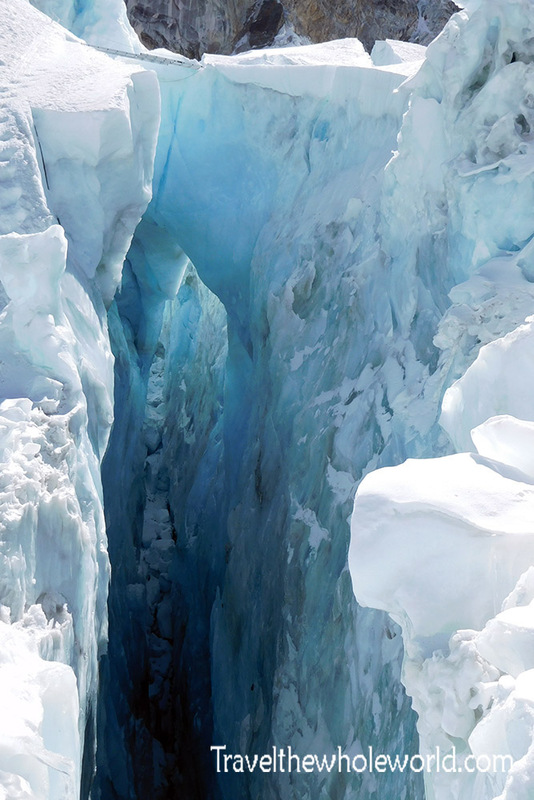 The photo above is a shot I took while crossing over the giant crevasse. I found the horizontal ladders to be one of the most uncomfortable parts of the entire climb. Crossing a ladder with crampons on felt very unnatural. On top of that the ladder felt unstable leaving you feeling highly exposed. Most other parts of the mountain you feel secure when you are on a rope, be it ascending or rappelling. Here there is an honest chance of slipping and doing so would have you dangling in the air if the ropes hold up! Despite me not liking the ladders this double one was actually my favorite. The scary part about this crevasse is it did not exist when we first went up through the icefall. One night in base camp the icefall suddenly split open here trapping several climbers for hours. It was so loud that it woke me up in the middle of the night. This was by far the longest horizontal ladder that we had to cross, but it felt safer being reinforced with two ladders on each side. Right in the center of the icefall was this flat and peaceful area. It was a perfect place to stop for a break, which we did on both our way up and down the icefall. The last time I came down the icefall on my way home, this area was completely destroyed. Normally we hiked straight ahead following the rope you see in the photo. When I came back down there was nothing but a big pit here filled with jagged boulders of ice. The second half of the icefall isn’t too different from the bottom, just maybe less ladders. 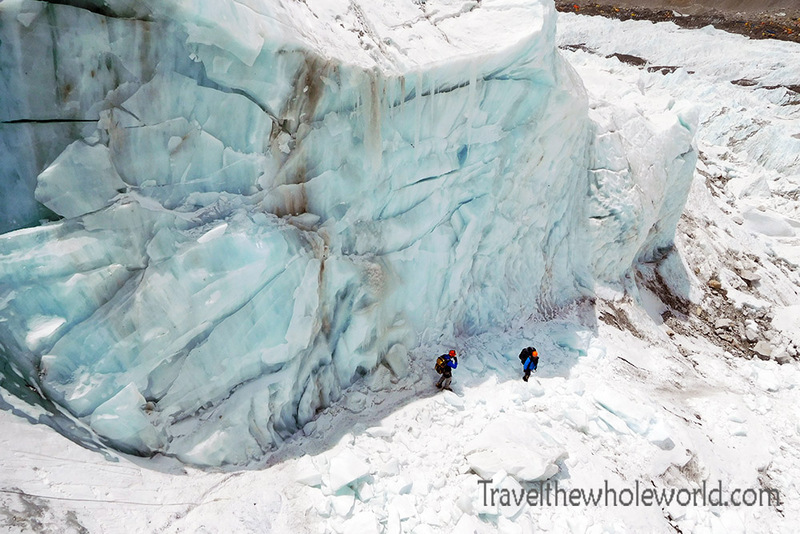 This photo above shows the very end of the icefall close to 19,500 feet (6,000 meters). The first time I went up through the icefall I loved every step of it. It was on my way down here that I passed under a giant piece of ice when it started rumbling. It was incredibly loud, and I seriously thought it was going to collapse on me. I honestly believed I might die at that moment and when nothing happened I got away from it as quick as I could. Someone who had been above me later told me he saw a large crack go through the giant piece of ice but stop halfway. After that experience I dreaded the idea of returning here and the thought of it was stressful. 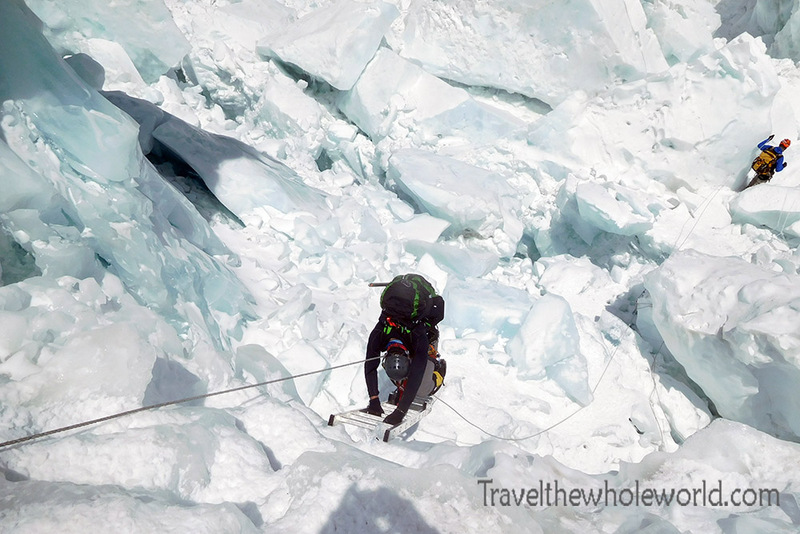 I do personally believe that the higher you get up in the icefall the more dangerous it is. This photo shows the end of the icefall as I approached it for the first time. Once you climb that wall, you’re home free. The ice here in my opinion is less stable since it has just freshly fallen. Anything can happen anywhere along this route, but the ice higher up has recently collapsed and is not as settled in as the ice further below. For those reasons I’ve always felt this area to be the worst part of the icefall. Another climber who was on my expedition also saw a large ice cerac collapse here, and disliked it so much he took a helicopter back down from Camp I! 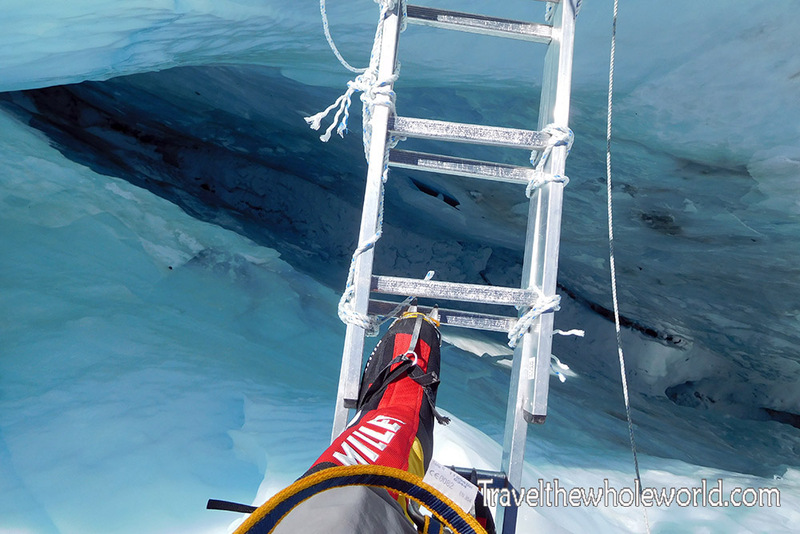 The photo below shows me rappelling down the upper entrance to the icefall as I headed back to base camp after spending over a week acclimatizing.